In the rescue biz, some animals are more difficult to place than others because of their perceived differences. Solid black dogs & cats. Pits. Seniors. 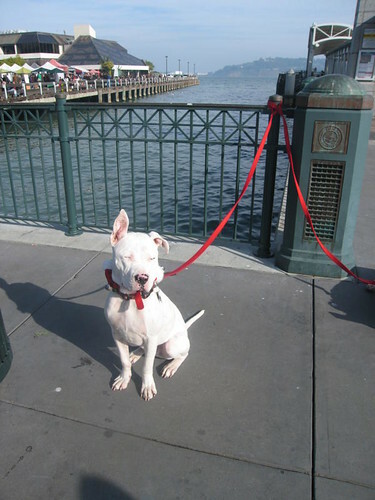 Consider today’s post a public service announcement for deaf dogs waiting for adoption everywhere. Stormy was adopted from Rocket Dog Rescue, at about 1 1/2 years old. He had never had a real home and had travelled from shelter-to-shelter. He was born deaf and based on the advice of owners of deaf dogs, I made sure that his dog tag indicated his lack of hearing. In regards to adopting a deaf dog, here are my impressions and lessons that I have learned. I went to deaf dog websites and read up. I got the following great answer to what is it like adopting a deaf dog: “Adopting a deaf dog is no different than a hearing dog. How you interact with the dog is based on the following criteria, in order of importance: 1) Size of dog, 2) breed of dog and 3) okay so they’re deaf” I liked that. A deaf dog takes more hands-on training, but they have just as much love to give as a hearing dog. I have always been a dog owner that believes in a lot of onleash training, so that works out well with a deaf dog. You must make sure that they cannot inadvertently run into traffic, which is the same with a hearing dog. I found Stormy to be a dog with a huge heart. He takes in everything around him, through sight and smell. He is being socialized to lots of different venues, just as one would do with a hearing dog. Do you see a theme here? A dog, is a dog, is a dog. Okay, one difference. When he goes into the backyard at night, I cannot just call him to come back in. That is what a flashlight or porchlight is for. Stormy is a star, and he is damn cute. You have done a great job with him. Stormy is beautiful or rather handsome should I say! Hurray for Stormy, who found his fur-ever home! Cheers to you, for loving him and training him. I had a deaf sheltie many years ago. She came to live with us in 1985, when there was no internet to consult on living with a deaf dog (glad to hear there are web sites now!). But a sympathetic Obedience trainer was willing to work with me and Tess became the best-mannered dog most people had ever met. She became a therapy dog and was beloved wherever she went. Mothers aren’t supposed to have favorites but of all the dogs who’ve owned me, Tess was probably the dearest to my heart. And yes, we also used a flashlight to call her in at night. Awwwh, what a great story. Deaf, blind, it is all doable. Thanks for the reminder. Taylor’s picture is up on my blog with her new tag. Thanks! In his prime we would play hide and seek. As soon as he wasn’t looking I would step around the corner which reinforced always keeping an eye one me. It wasn’t until he past away at 15 that I realized how much eye contact we shared through out a day just checking in with each other. Stormy will prove to be a beautiful gift for his family.